For year The CW has being the TV central for shows that no self-respecting adult likes to admit to watching [and yet everyone does]. From The Vampire Diaries to America’s Next Top Mode [you know you’ve watched it at least once], the network has more guilty pleasures than I can even count! On the cable side there is another network that is having quite a bit of success in creating guilty guilty pleasures that we would like to stop watching but can’t! I am talking of ABC Family. Even the name of the network sounds like something we should stop watching when we hit 15, however there is something very charmingly- addictive about their shows. Two twins are separated at birth. One goes out to live with a rich family in Phoenix, while the other goes to a foster home in Las Vegas. On top of one being poor and one being rich, we have a nice twin and an evil twin. What happens next? They switch places of course! There is a little more to the whole ‘parent-trap’ plot. The adoptive father seems to be more in the loop about the separated twins and there is some sort of scandal yet to be unveiled. There is a fair amount of teenage drama but the arcs of the adult characters are also intriguing which is rare in a teen show. I would say this show is a tinsy bit less soapy than PLL… but still pretty soapy. Another story of switched babies, but this time they are not twins they are just two random babies mixed up at the hospital. Of course one of the girls, Bay, has the good fortune to go live with the wealthy, while the other girl, Daphne, is sent home with a poor single mother. Oh and did we mention Daphne gets sick and goes deaf? When the girls are teenagers, the rich family finds out about the switch and they contact their missing daughter. Eventually, Daphne and her mom end up living in their pool house. As ridiculous as it sounds, this show actually has many redeemable qualities. First of all, the whole deaf situation is handled delicately, and I’ve realized there aren’t any deaf characters on television right now. We do have a handful of blind characters, but I can’t think of any that are deaf. If only for that, this show is at least attempting to fill that void and create some consciousness. 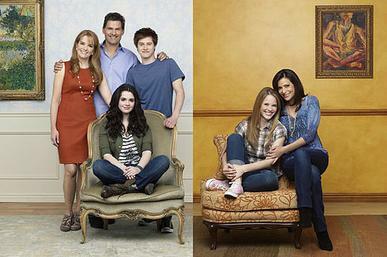 In addition, unlike Pretty Little Liars or The Lying Game, this show deals with actual ‘family’ issues. Therefore it seems more appropriate for the network. Last but not least, the cast is pretty good. It has Lea Thomson and Gilles Marini (OK maybe he is the main reason to watch it). The teens include that kid from High School Musical, but he is actually less annoying here, and Vanessa Marano, who I believe is going to be a huge star someday. All in all, this show is guilty pleasure for sure, but it is a pretty un-guilty option to watch with the family. Probably the guiltiest show of the list. This show is Disney on steroids and yet I have to admit that after watching an episode I can’t wait until the next week to see what happens. This charming little show has the basic plotline of a young assistant, Jane, trying to please her terrifying yet fabulous boss (Ally McDowel) and make it in the fashion world. The twist? The assistant is actually a high school girl, but the people in her office are unaware of that fact and think she is an adult. Chaos ensues as Jane tries to juggle her high school and high fashion lives. There is a cool dynamic with her best friend who is her sole confidant and may or may not be in love with her. In general all the characters are pretty well rounded (pretty Disney-fied though), relationships are sweet and believable and the plot constantly moves forward. This show has the worst title. Maybe I am a little dense but it took me a while to actually get and it sounds like some sort of mild insult, doesn’t it? If we are being honest I probably just stick around for this one because it is about dancers which are depicted as realistically as scrubs depicted doctors BTW… Bunheads is the story of a showgirl, Michelle, who marries a rich guy and moves to a little town in the middle of nowhere. The guy dies unexpectedly [which made perfect sense because it was the most unlikable character] but Michelle inherits his mother- in-law included-mansion. The show is from Amy Sherman Palladino who was the mind behind Gilmore Girls. Having said that, the show is pretty much an attempt of bringing GG back to life, not necessarily a successful attempt but if you enjoy listening to quick dialogue that includes more pop culture references than you can count, you may enjoy the show. However the characters and plots don’t seem to be going anywhere… so… let’s wait and see.